Looking for the Best Foldable Travel Bag? Here's Why I Love Scout Totes. Looking for the Best Foldable Travel Bag? Here’s Why I Love Scout Totes. What is Scout Plus 1 Foldable Travel Bag? Hey guys! This is the first official product review on my website. I’m excited because I know you’re going to love this foldable bag. Partnering with Scout Bags to bring you this review of the Scout Plus 1 Foldable Travel Bag made perfect sense because I use this bag ALL. THE. TIME. It’s an essential in my travel life and, because of my souvenir addiction, it is always on my packing list. So, what IS a Scout bag? My Scout 2-in-1 foldable travel bag is functional, ideal for packing, surprisingly spacious, and, most importantly, it is affordable. Update: This post was updated on February 2, 2019 to reflect new and relevant information. I still love and use my Scout 2 in 1 travel bag on nearly every trip! Last year, it traveled with me to 18 US states as well as England, Iceland, Belgium and the Netherlands. I’m happy to report that it’s still holding strong! We all have our own flare and so should your bag. 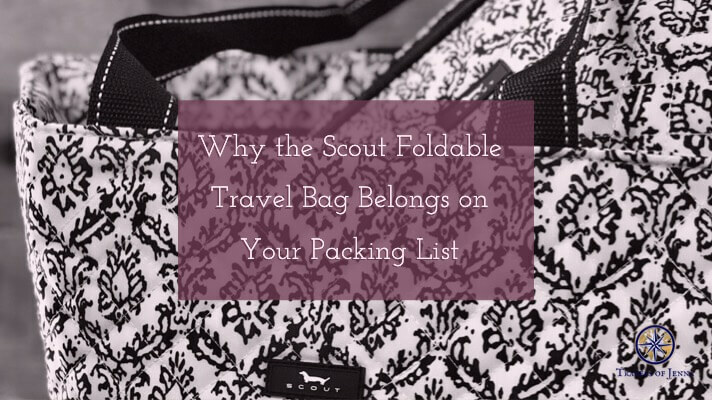 Scout currently offers 10 patterns to choose from when selecting one of their foldable travel bags. When I ordered mine, it was a toss-up between Midnight in Paris and the Swimfan. Ultimately, I settled on Midnight in Paris because I just love the black and white paisley. Since the original publication, some new patterns have been added and I especially like David Checkham (shown below) and Stripe Right. In total, Scout Bags now offers over 100 patterns to choose from throughout their collection. If you see one you love, you may have to act fast! Patterns retire over time and some only have a few items remaining. If you love a touch of personalization, Scout offers monogramming for just $12. You can add your initials or name up to 10 characters. Just select the option to personalize your Scout bag before adding it to the cart and follow the instructions to enter characters as you would like them to appear on the bag. I bet you’re asking, “What makes this bag so special? There are many reasons but one of my favorite things about the Plus 1 is that it fulfills it’s function and is also a bag that I enjoy carrying on it’s own. Unless your willing to spend an arm and a leg, it seems like you’re always sacrificing one or the other when it comes to practical and versatile travel gear, but this one really has it all and for a great price! The second thing I love about it is the space. I’m not sure what I expected size-wise but I was really impressed once I got it unfolded! Unpacked from its pouch, the bag dimensions are 22.5″Wx14.5″Hx7″D making it a perfect weekender bag. The little pouch then buttons in to hold all of your smaller items together. Another use I have found for the pouch is that it is perfect to carry down to the pool or the beach to hold a few items like my phone, sunscreen, room key, etc. Having a large bag that folds into a pouch is a great way to bring home all your travel goodies! So, it is functional and fashionable, but is it lightweight? If you travel often, you know how important this one thing is. If nothing else matters, THIS matters. Luggage space is prime real estate and a suitcase is almost literally worth its weight in gold considering baggage fees these days. As a matter of fact, the whole reason I pack this Scout in my bag is to carry on some of the heavier items I collect throughout my travels to avoid baggage fees at the airport. I think the best use of this bag so far might be hauling back all the Belgian chocolate from Bruges last year! The answer to your question is YES! Scout bags are made with quilted poly twill fabric. This makes the tote super lightweight. The design also mean that the bag takes up very little space as it folds into its designated pouch. A HUGE thank you to Scout for providing me with a Plus 1 for free in exchange for an honest review. As always, all opinions are my own. Traveling to Costa Rica my freshman year of High School. It’s very cute and looks like a perfect weekend bag. Thanks for sharing. Girl! I love Scout bags!!! They are the best – I have one from years ago and it has survived many beach trips, moves, and pool days! This looks so cute! I love lightweight bags. I’ll have to check it out! Looks like a great product for those that travel often. That is a really lovely and practical looking travel bag! How exciting to get to do a product review! Good job! Beautiful bag! Very cute pattern. And price is totally reasonable! I love this pattern and this bag could work very well for my travels, thanks for sharing. Those look like nice traveling bags. What would you suggest for traveling bags with kids? I simply adore this pattern. I want it on my luggage, my linens, my walls! Love the bag too! it is a great concept to help with packing. This looks like a great product. I love the design. I love these. We travel a lot and even just do day trips with the kids. This would certainly come in handy! Sounds like a great bag. Will check it out! Great bag! As much as we travel, we need this! So elegant, yet functional. Love that bag! I love my Scout bags! Love the bag and so chic! Love the design of this bag! Perfect for any trip! I have a serious problem with bags. I have way too many of them but I may have to add this one to my collections. It’s adorable!